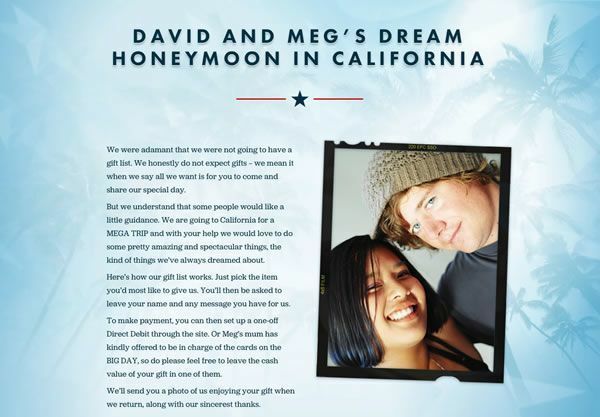 From the simplest honeymoon fund to the most detailed and unique itinerary, your honeymoon gift list can turn cash gifts into something meaningful and memorable. 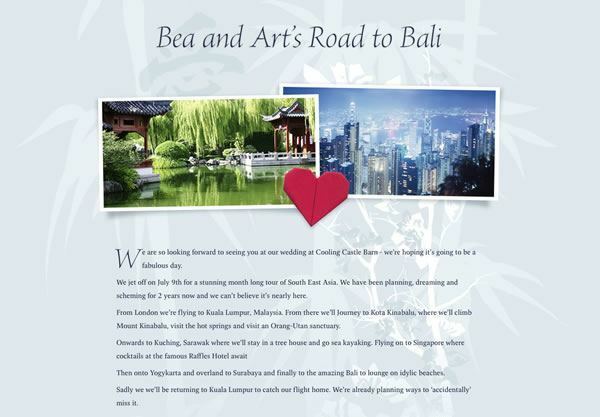 Any destination, any travel operator, whether you’ve finalised all your plans or not. 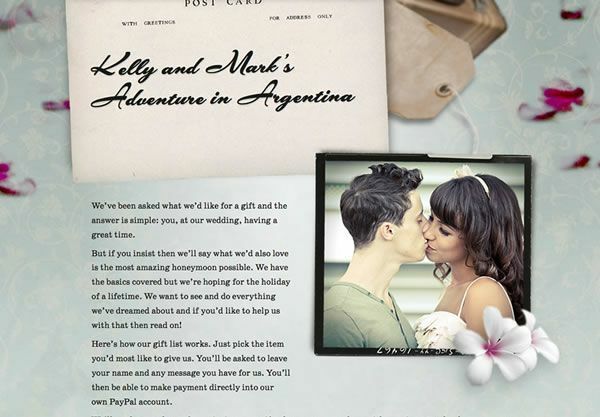 Beautiful designs, flexible gift payments, and no ads. A tour of Barbados, St Lucia, St Kitts, Puerto Rico, and Dominica. Two glorious weeks of sun, sand and sea in the Maldives. The best of Argentina and Patagonia: Ushuaia, Mendoza and Buenos Aires. 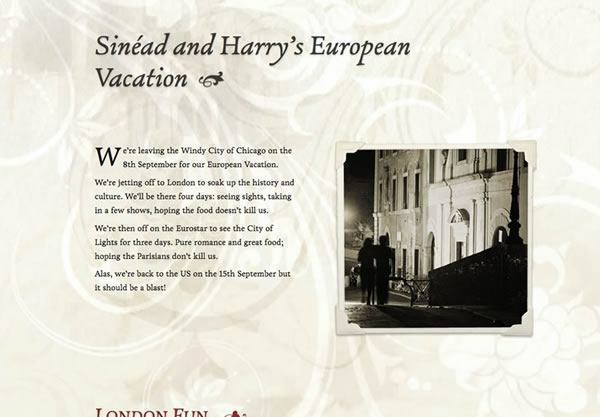 An eco-friendly Christmas honeymoon in the city that never sleeps. 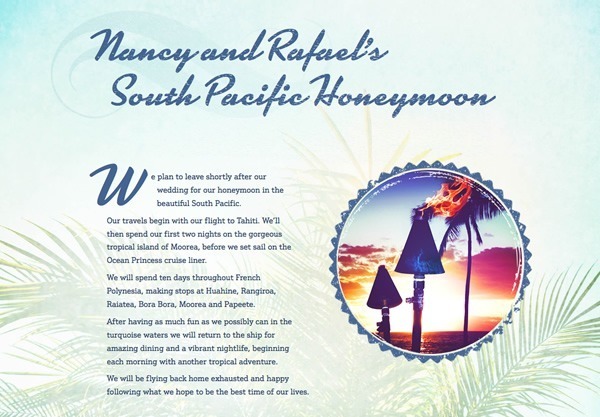 A simple registry to help fund a dream honeymoon to Fiji. A grand adventure under Californian skies. Art, food, wine, fun and luxury in the capital of Catalonia. 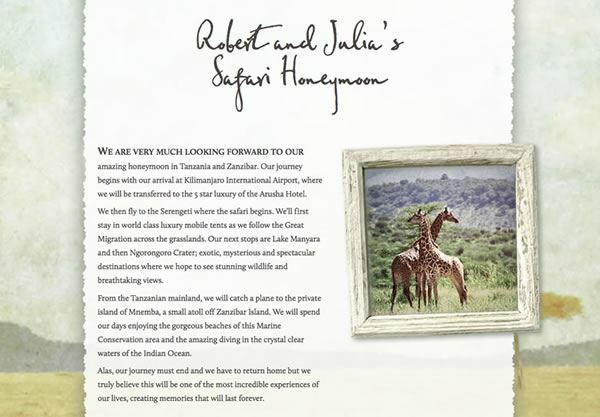 A luxurious and exotic honeymoon to Tanzania and Zanzibar. Ten days away from it all in a private Tuscan villa. 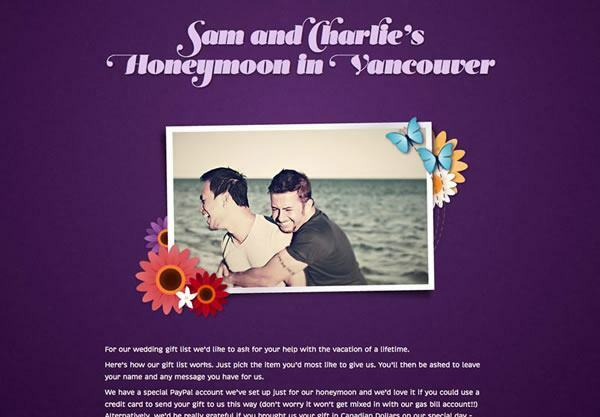 Canadian mountain scenery and urban nightlife amid the annual Pride Festival. Exploring the mystery and splendour of South East Asia. A fantastic tour of New Zealand — and household gifts for back in the real world! 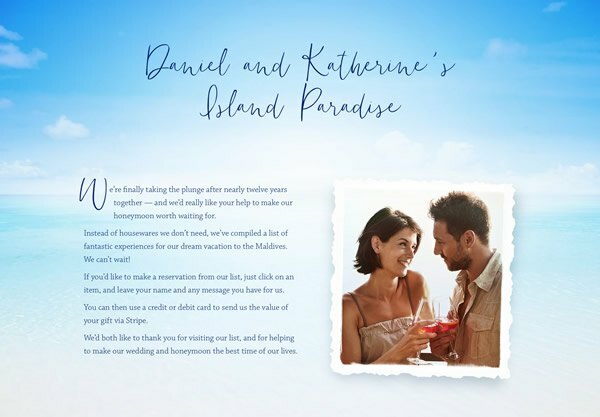 Do you need some inspiration for your own honeymoon gift list? 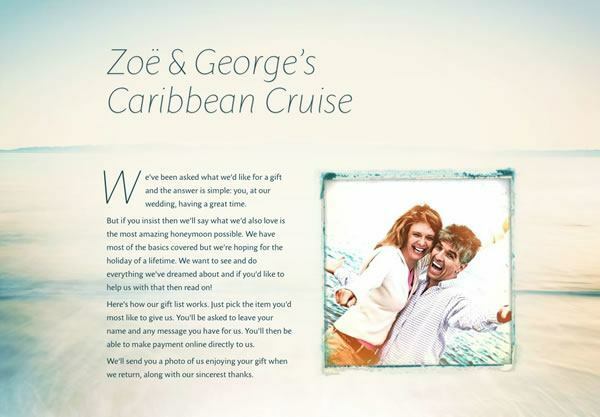 With our Helping Hand service, we’ll add a mix of great gift items based on your honeymoon destination. 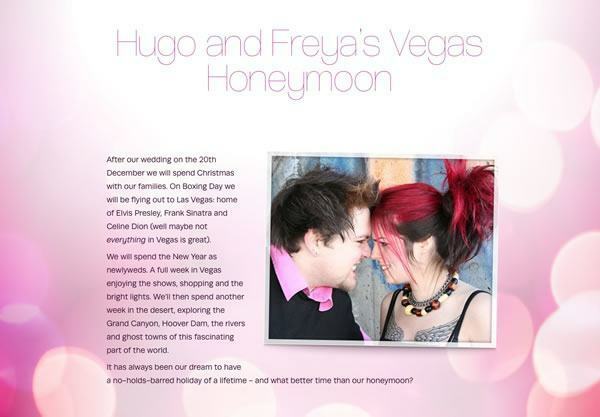 You can then edit and customise this ready-made honeymoon registry to your heart’s content! Our own honeymoon: Florida, New Orleans, Tennessee and Savannah. 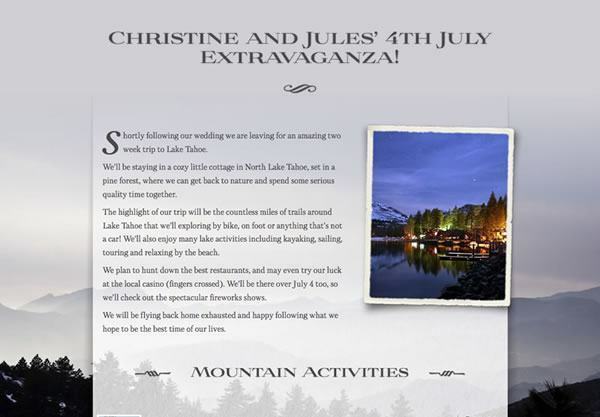 Christine and Jules 4th July Extravaganza! Hiking, biking and relaxing by the shores of Lake Tahoe. A tale of two cities: romance in London and Paris. A fabulous New Year honeymoon in the entertainment capital of the world. 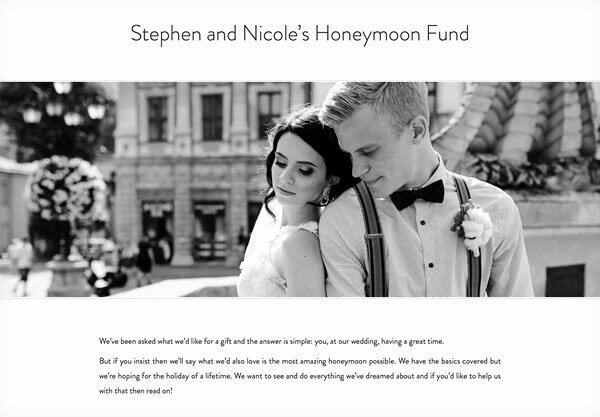 You get to fund your honeymoon. Your guests get to choose a gift that’s meaningful. We don’t hold on to your funds and we don’t take our fee out of the gifts you’re given. 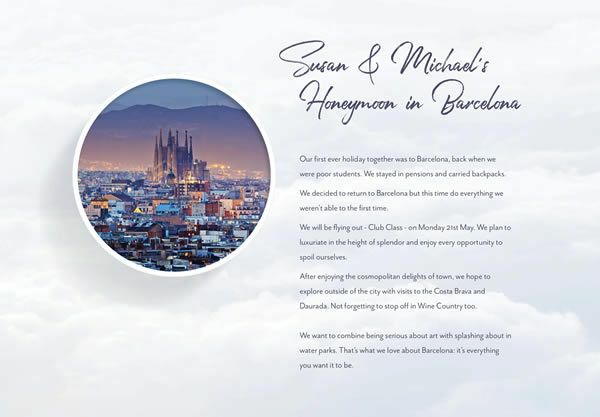 Simply the best honeymoon registry on the web. 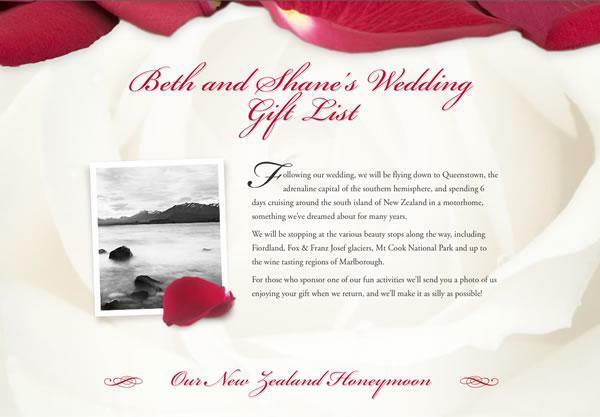 Brilliantly simple to set up, a really attractive and personalised gift list and our guests loved the easy to use site. The customer service and feedback was prompt and efficient. Thank you so much.